Whernside the second of the Three Peaks lies about 2 miles northwest of Ribblehead Viaduct and is the highest point in North Yorkshire with the summit lying on the county border with Cumbria. It is also the highest of the Three Peaks and in shape it forms a long ridge running roughly north to south. Whernside is not as attractive as Pen-y-ghent or Ingleborough but on a clear day the views from the summit to the west can be superb with views of the Lake District and Morecambe Bay (with the aid of binoculars) Blackpool Tower some 40 miles away. Whernside can be climbed as an individual peak from a number of different directions but the ascent from Ribblehead Viaduct is the easiest and most straight forward way. Ribblehead is an area of moorland at the head of the River Ribble in the Yorkshire Dales National Park. It is most notable for Ribblehead Viaduct and Ribblehead railway station. 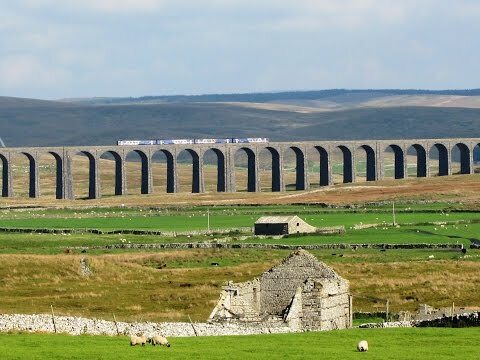 The very impressive Ribblehead Viaduct that carries the Settle to Carlisle Railway across Batty Moss was designed by engineer, John Sydney Crossley and built by the Midland Railway Company using the stone on which it stands. The first stone was laid on 12th October 1870 and was completed in 1874. The viaduct standing at 32 metres above the valley floor at its highest, is 400 metres long, has 24 arches of 14 metres apart with foundations of 7.5 metres deep. It took over a thousand navies to build this massive viaduct and they established settlements on the moors for themselves and their families. A hundred died during construction due to smallpox epidemics and industrial accidents. There are around 200 burials of men, women and children in the graveyard at Chapel-le-Dale and the church has a memorial to the railway workers. The Settle to Carlisle line which is famous for its stunning route through some of the most picturesque countryside of the Yorkshire Dales and Cumbria consists of 72 miles of track with 21 viaducts spanning the ravines and 14 tunnels. Ribblehead Viaduct is the longest viaduct and Blea Moor Tunnel just to the north near the foot of Whernside is the longest tunnel on the line. Originally the line opened for freight trains and then officially opened for passengers in 1876. It quickly became a tourist attraction and a house near the adjacent station was built specifically for the accommodation of visitors to this remote and wonderful part of the dales, Ingleborough’s caves also added to the attraction. British Rails attempts to close the line in the 1980’s, due to the viaduct being unsafe and would be expensive to repair, failed thanks to a campaign to save the Settle to Carlisle Railway. The viaduct along with the rest of the line was repaired and maintained and there are no longer any plans to close it. Ribblehead Viaduct is a Grade II listed structure. The land underneath and all around the viaduct, where the remains of the construction camp and navvy settlements known as Batty Wife Hole, Sebastopol and Belgravia were located, is a scheduled ancient monument. Today the Settle to Carlisle Railway line is still thriving and carries a combination of freight traffic and passenger trains. There are special arranged package trips focused around the history of the line and occasionally private operators organise steam-hauled trains on the line. Tourists and railway enthusiasts come from all over the world to admire it and travel on this much loved masterpiece of Victorian engineering. From the car park we cross the road heading towards the viaduct. We take the path uphill on the right of the railway line and keep following it. We eventually cross over the line next to the aqueduct bearing right to go through a gate. We bear off left heading uphill until we come to a stile. We turn left over the stile and follow the path bearing right uphill to the wall. We keep following the path with the wall on our right for a short way and then the path bears left uphill. At the fence line we bear left and head forwards to the summit. We keep heading forwards with the wall on our right and soon start heading steeply downhill. The path turns left downhill to the valley bottom and we keep following it to a farm. We go through a gate turn left and left again to go through another gate. We follow the path through a field to the next farm called Broadrake and follow the white arrow painted on a stone. We keep following the path through the fields and through the next buildings. We now follow a tarmac track crossing over a cattle grid and keep heading forwards towards Winterscales Farm. At the gate and the cattle grid just before the farm we follow the track to the right to go through a gate and keep following the track past the buildings of Gunnerfleet Farm. We go through a gate and turn left over the bridge crossing Scales Beck. We head forwards going under Ribblehead Viaduct then make our way back to the car park. This is a moderate to hard walk on good well maintained paths and tracks with some steep but not severe inclines and declines. Approx 8 miles allow 3¾ to 4¾ hours using OS Explorer Map OL2, Yorkshire Dales, Southern and Western areas. Start point: large car parking lay-by next to the junction to Horton in Ribblesdale. Ribblehead Viaduct at Ribblehead situated on the B6255 approx 5 miles north of Settle in the Yorkshire Dales. From the A1 take the A684 to Bedale, Leyburn and Hawes. Make your way through the centre of Hawes and when the main road bears right to Sedbergh take the left turn to Ingleton on the B6255. Follow this road until Ribblehead Viaduct is seen on the right, car parking lay-by is on the left just before the turn off for Horton in Ribblesdale. From the A65 take the B6480 to Settle then take the B6479 passing through Horton in Ribblesdale. At the t-junction with the B6255 turn right. Large car parking lay-by is immediately on the right. Parking: Free large car parking areas and lay-bys along the B6255 near Ribblehead Viaduct. There are no public toilets the nearest ones are at Horton in Ribblesdale. For refreshments there is a pub, The Station Inn, just near the railway line and in nearby Horton in Ribblesdale there is the Pen-y-ghent Cafe and two pubs, the Crown Hotel and the Golden Lion Hotel. The nearest town is Ingleton.